A few months ago I shared my ten pantry essentials that I keep on hand at all times. 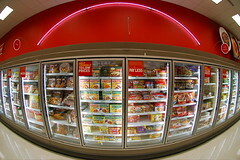 It’s time to move our gaze to the freezer and see what must-have items are stored there. 1. Chopped Onions. You won’t catch me chopping onions. If I couldn’t buy fresh frozen chopped onions, I would use dehydrated. Otherwise, I’d be cooking without them. 2. Pepper Blend. I buy a three-pepper blend at Trader Joe’s that has green, yellow and red bell peppers chopped and use them in all kinds of recipes. 3. Ground Meat. Both ground beef and turkey are staples at our house. I try to limit our intake of red meat so use turkey wherever I can. No one (except me) likes the meatloaf made with all ground turkey so that dish gets a mix of both. 4. Berries. When they’re not in season, we stock strawberries and blueberries to mix in yogurt and pancakes. 5. Vegetables. Strangely my family seems to prefer canned vegetables to frozen. I buy frozen vegetables that they won’t eat just for me or to include in soups and stews such as spinach or mixed vegetables. 6. Chicken. My husband thinks I could eat chicken every day. Don’t tell him but he’s probably right. There are so many ways to prepare my favorite protein. I keep packages of boneless skinless tights and breasts on hand. 7. Meatballs. Before I started buying turkey meatballs I put Italian sausages in the spaghetti sauce. These are lower in calories and fat as well as price. Plus, they taste great. 8. Brown Rice. Did you know it takes almost twice as long to cook brown rice as white? That’s why I buy frozen brown rice that only takes 3 minutes in the microwave to prepare. We eat healthier and at home. 9. Meals. Sometimes I get home too late to cook or am just worn out. For those occasions, we keep a few frozen entrees on hand. We’re not picky and buy whatever is on sale. 10. Desserts. We do seem to always have at least on carton of ice cream but I also have low-calorie options such as Vita-tops or Weight Watchers treats. Keeping these essentials in the freezer makes it easy to create a meal plan for the week. What would you add? Great list 🙂 I second the frozen vegetables point! I always have frozen peas on hand to throw in soups, stews, salads, etc. I even eat them as a snack. Rice isn’t the only grain I keep in the freezer (though I make it myself). I also free millet — it’s easy to digest, goes well with just about everything and I use it in muffins. I always have chicken soup on hand too. It makes a quick meal and it’s healthier to have on hand than canned soup for when you’re sick. Elizabeth, I’ve never tried millet!. I’ll have to find it at the store. Homemade chicken soup would be great in there but I don’t think it would last long (because my family would eat it!). We usually have juice from concentrate that we’ll pick up in bulk when we can get a good sale/coupon combo, as we all enjoy having a glass of juice in the morning (me pretty much only on weekends). And I love the pepper blend. We use it on everything. So yummy. @ Money Beagle, that’s a good item to add to the list. I drink V8 so it’s not available frozen. @ Christine, That’s a good idea to freeze my own rice. We’ll try that and put our rice cooker to work. Really good post, some of these things I wouldn’t really think of straight away, but they really are freezer essentials! Frozen waffles (my kids live on them…). I always keep a loaf of garlic bread in the freezer to go with those days when I don’t have a lot of time and need to whip up a quick spaghetti dinner. I’ve purchased that same Trader Joe’s 3-pepper blend as well, it’s really good for stir frys. Very convenient too. Really, I would say frozen veggies are in my freezer at all times…and also a couple of frozen meals as backups. Good to keep just in case. @ Personal Finance 4 All, these are the things I always stock in there. Glad you like the list! @ Money Reasons, my freezer staples when my kids were growing up was quite a different list. My husband and I try to eat healthy but we also had treats in there as well! Sorry, you don’t have a Trader Joes. @ Len, we often do have frozen rolls or garlic bread in the freezer. I should stock it though since we eat spaghetti regularly (with those turkey meatballs!). @ Squirrelers, I should make a stir fry soon. Thanks for the idea. @ Money Cone, I must confess that hot pockets are usually in our freezer but not for my husband and I. My adult son practically lives on them. I had no idea you could buy frozen onions!! I have to check that out. 2. Pea soup. Again, make huge quantities and freeze some for a later meal. 3. Popsicles. It seems like someone has had a sore throat in my house for months now. Kris, I usually pay $1 for a bag of about 2 cups of chopped onions. That’s great that you make homemade sauce. I buy Ragu chunky when its on sale and usually get it for about $1 a jar. We used to stock waffles and popsicles when the kids were still kids. Great tip about the peas! Agree entirely on the frozen turkey, we substitute it for most everything but hamburgers. Tacos, spaghetti, chili and even “vegetable soup.” So healthy, and so much protein. With that said, though, have you seen the price lately! Astronomical! JT, I buy the ground turkey when it is on special buy one get one free. If I run out and it’s not on sale, I get a four pack at Costco for a decent price. Puree of basil and olive oil, frozen in ice cube trays, and kept in zip loc bags. They can be the beginning of pesto (garlic doesn’t freeze well) or the equivalent of fresh basil in any dish. Cathy, what a great idea! I don’t buy (or grow) fresh herbs because I wouldn’t use it all before going bad. This idea solves that problem. 1. Homemade stock – chicken and/or veggie. I freeze some in 1-cup batches and some in ice cube trays (and then in ziplocs). Easy to throw the cubes into anything, as they are about 1 oz apiece. 2. Chopped up celery – I never get through a whole stalk so i chop the rest and put it into ziplocs. I do the same thing with bell peppers. 3. Homemade yogurt – also in 1 oz cubes so I can make smoothies at any time. Yogurt is so easy to make I’ll never buy it again. Sarah, another great tip on ice cube trays. I will try making stock the next time I have a chicken carcass. I didn’t know you could freeze the celery and usually throw out so much. Buck, are those homemade dumplings? I never make them myself but if you know a good place to buy them frozen let me know!